For nearly six millennia, people all over North America have been using a spiky green leaf to help improve their health. In fact, I’d be willing to bet you’ve used it a handful of times and never realized how potent it really was. Aloe vera’s one of the most common natural treatments in America; it’s so prevalent, you can find it in regular grocery/drug stores all across America. And while it might be common, I don’t think most people truly understand just how powerful aloe vera is. The best part about it, though, is it’s a hardy plant that’s quite easy to grow. It also has a wide range of health applications which are useful in everyday life. That’s why I chose to write about it today. 1 – It Helps Keep Blood Sugar Healthy: It’s estimated as many as 14 million Americans have concerns about blood sugar management, and many people hope their doctors will just give them a pill or a treatment to help improve their blood sugar. But what if you didn’t have to take a pill? What if a little plant you can grow on your front porch helped do the trick? Turns out aloe vera has been shown to help improve blood sugar and HbA1c in individuals with blood sugar concerns. Recently, researchers at the U.S. Air Force Medical Center performed a meta-analysis on nine different studies regarding aloe vera and blood sugar. After a long, hard look at the research, they discovered almost all subjects who took aloe vera orally saw significant reductions in their blood sugar levels, and even in their A1C levels. Pretty impressive for something you typically associate with sunburn treatment. Another meta-analysis focused on eight randomized clinical trials, and how multiple forms of aloe vera (including aloe juice, aloe powder, aloe extract, and crushed aloe leaves) might affect blood sugar. The research concluded it didn’t matter what form of aloe was being used; almost all subjects’ blood sugar and HbA1C levels improved when ingesting it. 2 – It Helps Heal Aging Skin: One of the main reasons aloe vera is included in so many skin products is because it’s been used for centuries to treat dry and damaged skin. Fortunately, if you’re using aloe vera for skin therapy, it’s not like you’re placing blind trust in old wives’ tales about its effectiveness. Studies prove it really can make your skin more radiant, and can decrease the effects aging has on your skin. In fact, one of the most promising studies has to do with aloe vera’s ability to enhance collagen production in your skin. Collagen, the protein in your body responsible for the health of your skin (as well as the health of your ligaments, joints, tendons, etc. ), is what helps give skin its firmness. Now contrary to what you might think, this study showed that the health benefits derived from aloe required you to ingest it (as opposed to using it topically). In the study, 30 women who were 45 years and older were asked to ingest aloe vera gel in either a 1,200 mg daily dose or a 3,600 mg daily dose. In just 90 days, facial wrinkles improved in both groups. Surprisingly, skin elasticity in the lower dose group actually increased. Other studies have shown aloe vera helps reduce skin redness, and might even have medical uses as a therapy for psoriasis. 3 – It Can Make Teeth Healthier: Now I might not be a dentist, but that certainly doesn’t mean I don’t care about the health of your teeth. The fact is, the health of your mouth is very much related to the health of the rest of your body. And that’s why you need to know about aloe vera’s ability to promote better dental health. Several studies have shown using aloe vera juice as a mouthwash (versus using a standard mouthwash containing chlorhexidine) is just as effective for killing dental plaque. In one study, 300 people were asked to use 100% pure aloe vera juice for their mouthwash. Four days later, their mouths were checked to see how much dental plaque had built up. The researchers noticed the aloe vera juice had killed dental plaque to the same degree as the standard mouthwash. A similar study extended the duration from four days to 30 days, and found similar results. The reason aloe vera is so effective is because anti-bacterial compounds in the juice kill the bacteria Streptococcus mutans, along with the yeast Candida albican (which are known to cause dental plaque). 4 – It Helps Treat Burns: I can’t tell you how many times I’ve seen people following an old remedy to help treat a condition without knowing if it works or not. Sometimes they gain the benefit of the placebo effect; other times, they’re just throwing their money down the drain. However, there is solid scientific proof aloe vera is an incredible healing agent for treating burns. One randomized study by a team of surgeons in 2009, for example, looked at 30 patients with second-degree burns and found that aloe cream completely healed minor wounds in less than 16 days, compared to 19 days for silver sulfadiazine, a common antibacterial cream used to treat burns. 5 – It May Help Relieve Dangerous Inflammation: Like most plants, aloe vera is rich in enzymes, and these enzymes play a big role in how your immune system responds to inflammation. Out of the eight enzymes present in aloe vera juice, bradykinase is most helpful at helping modulate how your body responds to acute (and perhaps long-lasting) inflammation. When your body experiences an inflammatory reaction (whether due to illness or injury), a substance known as bradykinin “turns on” and causes painful inflammation. Bradykinase is known to have anti-bradykinin properties; so, when you take aloe vera, bradykinase will “shut down” bradykinin and will, in the process, reduce inflammation. You only need just a little bit of aloe vera to help reduce common inflammatory responses. 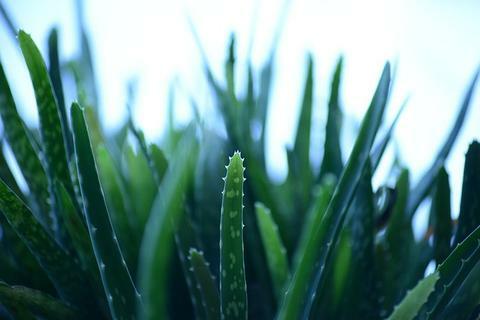 In this regard, aloe vera can help knee pain, back pain, shoulder pain, and other joint pain. The truth is, aloe vera’s benefits don’t just stop there. My first recommendation if you want to use aloe vera is to grow it yourself. This plant is incredibly easy to grow (just search YouTube), is quite affordable, and looks good, too. Of course, if you’re busy like I am, lending your mediocre botany skills to growing aloe vera might not be the best course of action. In that case, I recommend getting Aloe Vera Juice. This juice is super easy to take (just mix it with water, or drink by itself); it has a non-offensive taste, and includes many of the health-altering properties you’d find in the gel/leaves. Because aloe vera’s so effective at helping improve health, I started carrying it in our online store not long ago. We have it right here for a great price, so try it out and see how it improves your health.